I went for a walk along the sea by the Parade. It was pleasurable, the day warm but not hot - early morning with all its promise. I noted two women talking intently by the sunburst - they had brought their thermos along. They weren't nattering, they were engaged in seriously enjoyable dialogue. I strained my ears to listen and thought I caught a foreign accent - either French or Italian. Few NZers would do this - the sea and a notion of civilised behaviour beside it in an urban setting - means something different to us. Later by the fountain I came across two unlikely pilgrims - elderly - a woman in a sort of Chinese hat, a face mask almost over her lower face. The man appeared European but he was equally weather-beaten and also covered. He wore gloves. I wondered if he too had carpal tunnel syndrome. I thought not. Something about their singularity. 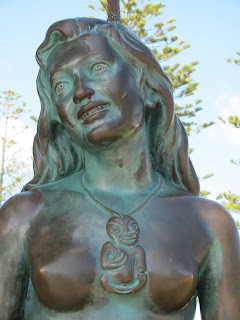 They had just looked at Pania who, in the early morning light, seemed to leer with her polished breasts and strange almost Hollywood conception of a Maori face. I thought of how my last book, 'The Hungry Heart' , a biography of William Colenso, was held together by the brace of place. This place. I was conscious of the sea being the same sea (in some form) that William Colenso had seen and which he also meditated by. 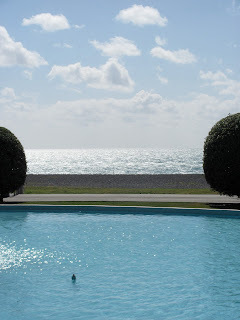 Once I used to think of my Napier grandparents but now I saw they were probably busy working - and they actually related more to the (now vanished) inner harbour and port. But walking back I faced Bluff Hill and my eyes almost accidentally found the cleat in the Hill where the Napier prison was. This was where the Hau Hau proophet/warrior - or alternatively terrorist - Te Rau Kereopa was hanged in 1872. This is the core of my next writing project. I was shocked into thinking again of place, and how place is what drove me to this new story. The mystery and power and particularity of place. Colenso was a rare being - he was one of the defenders of Te Rau Kereopa, an astonishing act of bravery - amounting almost to the foolhardy. But seen from Colenso's pov this was the time of year in which he himself had faced rock bottom. It was the time of catastrophe for him: January was the month he had been ejected from his religious calling, his children taken from him and his mission house burnt to the ground (was burnt to the ground? ): it was when he went into court to face a terrible public humiliation. So for him too January was not…a light month, an easy month. A time of stirring, painful memories.